There is a perceptible nip in the air. The lethargy of the summer months has made way for the vibrancy of the pre-winter festivities and consequent changes. Fashion wise, cottons have made way for mixes while hemlines, necklines and sleeves have changed direction. Food wise, this dip in the temperature has heralded a gradual change in dietary requirements. Chilled beer, or wine, is no longer the preferred pick-me-up and crunchy salads will soon be pickled. No doubt, the ensuing winter months are eagerly awaited by different folks for different strokes. 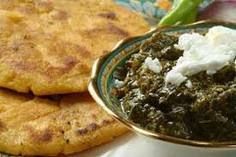 But for those with even the remotest connection to farm life, these months mean overdosing on saag and makki di roti. Excess being a cultural thing in this part of the world! Although city living has taken away much of the pomp that goes into the preparation of this wholesome combination, the pleasure, of going through a piping hot bowl of the stuff, drowned in desi ghee or topped high with churned butter(whatever be your poison), with a slightly overdone makki di roti, remains unchanged. Most households have their own side-dishes to go with it – could be smoked onions, grated radish salad, ginger juliennes, even scrambled eggs. Traditionally, lassi is meant to be consumed as part of the meal but, frankly, it does nothing for me. It’s a drink I prefer to leave behind with the rest of my summer memories. For one, if you were to drink it before-hand, you won’t be able to do any justice to the food. Two, if you were to keep it for later, where do you think you’ll put that last, albeit customary, makki di roti with shakkar? Although some of us prefer to end our saag saga with a round of reoris, gajjak and peanuts. 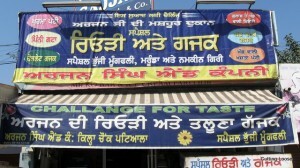 This may sound unpalatable to a lot of people out there; not if you have grown up in Patiala. And never, if you have walked the length of the Adalat Bazar, past the landmark Water Tank, turned right into the Juttianwali Galli and arrived at the clearing near the entrance of the Qila Mubarak. Right here, adjacent to the Police Chowki, is located the very cause of our contrarian beliefs – Arjan Singh, who is known to do magical things to molasses and sesame seeds, and produce myriad reasons to shun traditional eating habits.